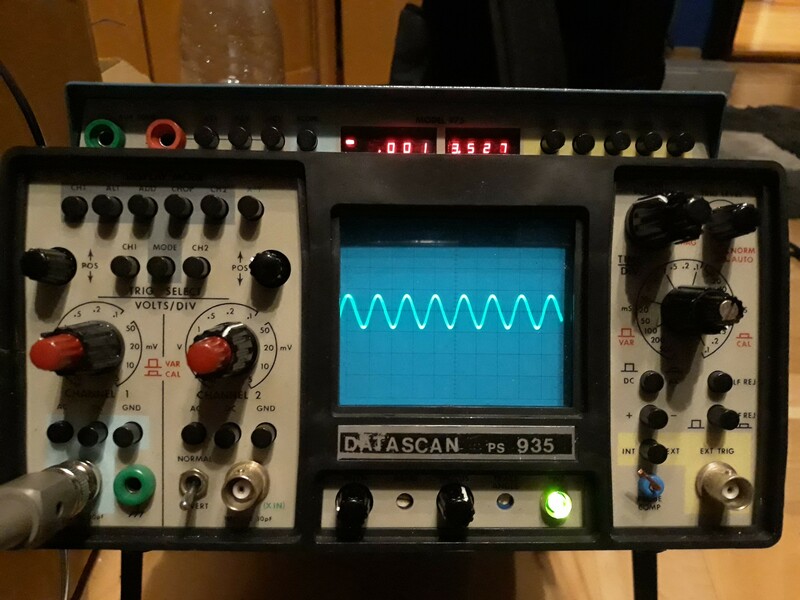 I designed a Clapp VFO to aid in my Ham Radio projects (Non-superhet SSB and CW recievers for 80M and hopefuly 40M). I chose the clapp topology for it's frequency stability. I want it to tune at least from 3.2MHz to 4.2MHz and have low harmonics. It'd be nice to be able to tune for 7MHz as well. Is my circut good, are the C2 and C3 values? I know values are diffrent in the sim and schematic. Q2 is to buffer the oscilator. The RFC radio frequency choke, in collector of Q1, will allow that collector to swing above rail. That swing above rail may saturate Q2, depending on drop across R4. 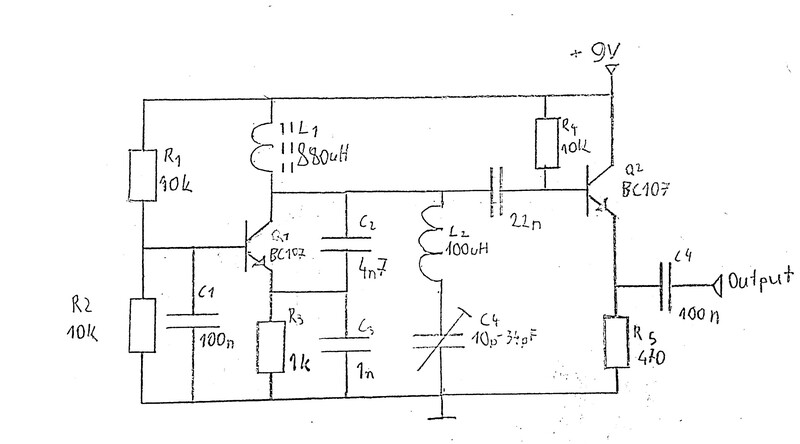 I'd bias the Q2 base at VDD/2, using dual 22Kohm resistors in series as a voltage divider. These biasing resistors may be setting the Q of your oscillator. Is that OK? When you build this, use a 1" by 4" strip of copper foil to serve as your ground. Or a ground plane. 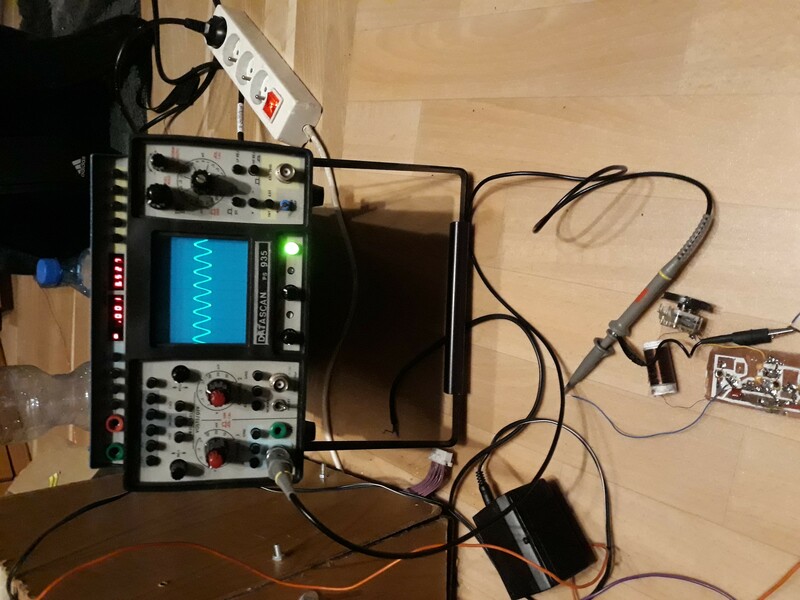 Keep any switching power supply far away, or the 100,000 Hz switchReg chopping magnetic field will couple into your Clapp oscillator and cause 100,000 Hertz sidebands. This will mix any 100,000Hz--off--carrier energy into your audio output. Add 100 Ohm resistor in series with the +9v rail, and use 10uF and 0.1uF from top of L1 to Ground (that piece of copper foil). You may get LOADPULL back from the Mixer. This will increase sidebands on the oscillator. Add a common-emitter Q3, gain of 1 or 2, with lots of headroom to avoid saturating the bipolar. Let that drive the mixer. Isolate every device from the +9v, else that rail will be a shared-node and lots of instability may result because of the rail-based feedback. Use 100 ohms and 10uF (1 millisecond Tau). The 100 ohms also guarantees dampening. 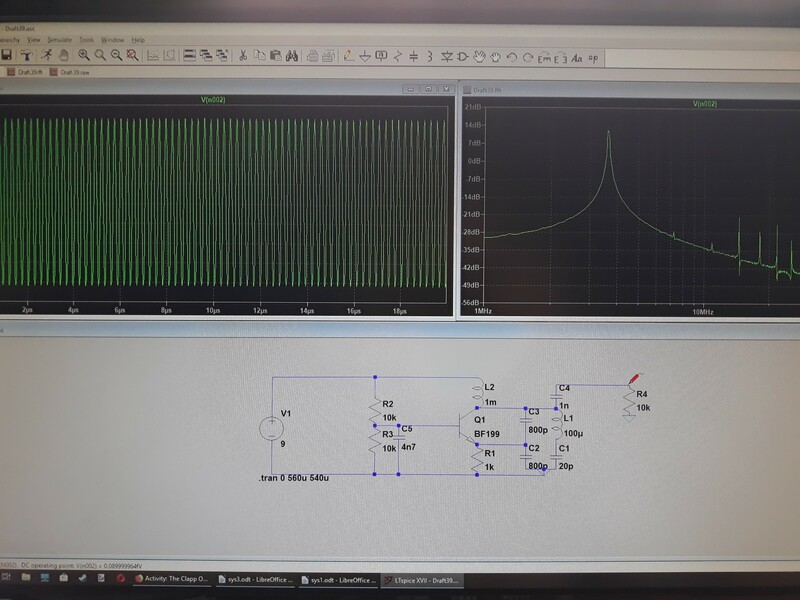 This circuit, with isolation (gain of -1) amplifier, is intended to provide lots of isolation from the Mixer non-linearities. This helps preserve the oscillator purity. Because of the unknown Clapp amplitude (limited by some nonlinearities), we can't predict the Q3 output voltage swing. I did set the Q3 current to 2 milliAmperes, thus Vcollector should be (possibly clipped) at 2vpp. Notice the use of 47pF(2 places), to make explicit the presence of Low Pass Filters. These help with harmonics, assuming the tank-circuit voltage (top of C2) has residual distortion from energy injection from Q1. [edit the final stage, for even better loadpull; the common-base final transistor is the key. The base-bypass cap sets the ultimate reverse isolation value; keep the inductance to GROUND as low as you can. Not the answer you're looking for? 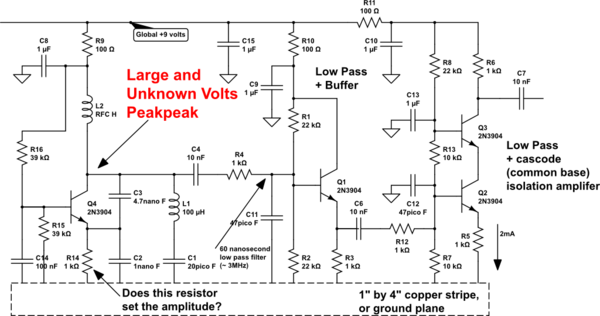 Browse other questions tagged transistors bjt oscillator radio ham-radio or ask your own question. Where is the oscilator in the 555 chip provided here? How do changes in α affect β for a BJT?